National Express offers not only bus and coach travel, but National Express Rail Services on many rail routes across the UK. National Express offer Britain’s only scheduled coach network reaching around 1000 destinations in England, Scotland and Wales. They operate popular lines like the c2c, National Express East Anglia lines, with Stansted Express being a component, and National Express East Coast Lines. You can Book National Express Train Ticket Here now and save pounds on your train journey. National Express Coach carries more than 16 million passengers each year, providing top of the range rail travel services throughout the east coast of England. Customers easily get the best value for money ways to travel throughout the UK, to airports and into Europe. Like their bus services, National Express Rail offers first class services on board their trains. Travel in style on the National Express train. From London Liverpool Street to Norwich. Any destination. You can get a quick train ticket using the box below. This vibrant rail company took over rail service routes hitherto operated by First Group in Eastern England. It now has three main destinations or route branches on the UK railway system. It is always a good idea to check if your travel destination is covered by National Express before getting your train tickets. You need not worry if you can not find your preferred rail route listed below. Just type in your travel start point and destination here on the rail travel section and get not only details about the routes available, but also access to coach times, fares and printable e-tickets! You can get on this route to and from London and Edinburgh, with stops and pick ups in rail stations such as Peterborough, Doncaster, Leeds, York and Newcastle served on the way. The service also runs to Glasgow, and from these two destinations almost everywhere on mainland Scotland is catered to. Due to incorporating destinations such as Leeds, York and Newcastle, if you are looking to explore some of the great cities in the UK and want to travel quickly and without the hassle of driving, then the National Express rail service could be exactly what you need. Several smaller towns are also catered to en route, giving you the chance to choose either a city break or to go exploring in areas where tourists don't usually visit. , which operates between London and towns such as Chelmsford, Braintree, Maldon, Colchester Ipswich, Norwich, Cambridge, Stanstead airport and the seaside, including Great Yarmouth or Lowestoft. These services offer travelers real flexibility and you get to see the wonderful East Anglian countryside as you travel around. The National Express also runs local services that operates in the immediate eastern vicinity of London, namely Essex, offering travel from Leigh on Sea, Westcliff, Thorpe Bay and Basildon and a whole host of other Essex towns, direct into London. Some trains depart from London Fenchurch Street and others from Liverpool Street. These may be small and quite local trains, but they bring you quickly and efficiently to towns that you may never have thought of visiting. Many are extremely interesting, and it is great to see different sides of life in the UK in the 21st Century. So with an extensive fleet of trains, as well as some great destinations, you will find that National Express Rail Network offers a fantastic way to see some of the best parts of the UK in all their glory and in a way that you can't see when in a car or on a coach! Also remember, buying your train ticket directly from the train operating companies saves you money on your travel. 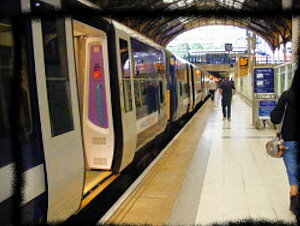 Do you have a great story, questions, or comments on National Express Train travels? Share it! Please feel free to also comment on queries and views posted by other users below. Return to "National Express" from "National Express Rail"